This bespoke aquarium in Hertfordshire is one of a number of ‘off the shelf’ style aquariums that we have supplied, although the filter system is anything but ‘off the shelf’. 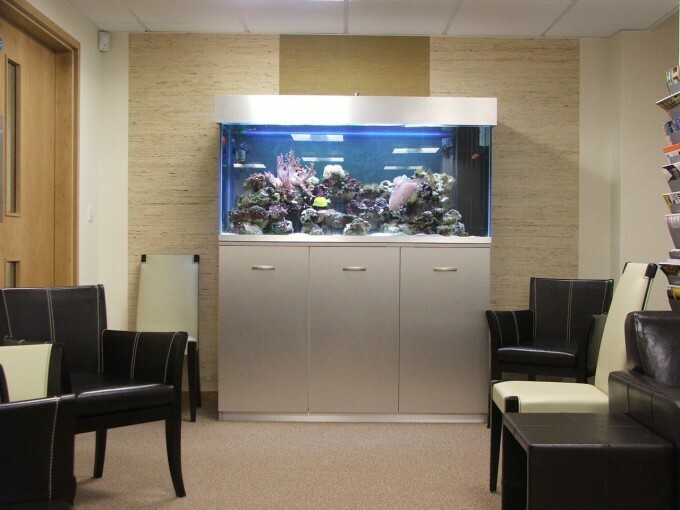 It was set up in a private clinic as a marine aquarium with soft corals as well as fish. There is something like 50kg of live rock in the aquarium along with the fish and corals. This aquarium has a sophisticated, sump based filter system incorporating a calcium reactor, skimmer, fluidised reactor, top up system as well as heater and return pump. It is lit by T5 lights.